Julie struggles with understanding why her Halloween trick-or-treating got cancelled, or why Grandma can’t remember her name. Julie is struggling with understanding her grandmother’s Alzheimer’s disease. There is a growing need to explain Alzheimer’s Disease to young children. I recognized this need some time ago, and since no book really existed aimed at the 4 to 10 year old audience I decided to tackle this need along with my colleague Carolyn Given. Not only did I want to explain this disease, but I also wanted to provide these young caregivers (children) with some useful coping mechanisms. 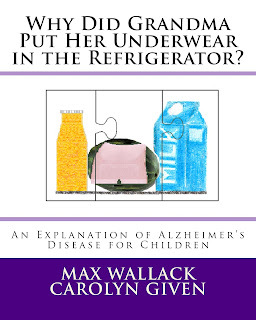 I am pleased to announce that our book, “Why Did Grandma Put Her Underwear in the Refrigerator, a Book Explaining Alzheimer’s Disease to Children” is now availabe for purchase on Amazon. The book was co-authored by myself and Carolyn Given. 50 percent of the profits from this book will be donated to Alzheimer's causes. Below is a description of our book, which I hope will be helpful to the millions of children living their daily lives touched by Alzheimer’s disease. On some days, seven-year old Julie feels like she’s living in a Fun House. Hers is a topsy-turvy world where the toaster sprouts a toothbrush, and a watermelon gets dressed up in pink underpants for Fourth of July! But on other days, Julie struggles with understanding why her Halloween trick-or-treating got cancelled, or why Grandma can’t remember her name. Julie is struggling with understanding her grandmother’s Alzheimer’s disease. Authors Max Wallack and Carolyn Given believe that no child is too young to learn about this disease, or how to participate in providing safe care for their loved one. Why Did Grandma Put Her Underwear in the Refrigerator is a sensitive, light-hearted children’s story that seamlessly provides its young readers with a toolbox to help them overcome their fears and frustrations. It shares easy-to-understand explanations of what happens inside the brains of Alzheimer’s patients, how to cope with gradual memory loss, with a missed holiday, or even a missing Grandma! This 40-page fully illustrated children’s book is told from a second-grader’s perspective in her own style and vocabulary, but it lovingly shares real strategies, scientific insights and lessons of dignity from which adult caregivers may also benefit. Max Wallack has received numerous national awards for his work on behalf of Alzheimer’s patients. These include the Nestle Very Best in Youth Award, the Citizen’s Bank Trufit Good Citizen Scholarship, the Diller Teen Tikkun Olam Award, the Jefferson Award for Public Service, the Daughters of the American Revolution Community Service Award, and the President’s Call to Service Medal. He has published in respected journals in the field of Alzheimer’s disease and has presented his work at national and international conferences. Carolyn Given is an experienced caregiver herself and an acclaimed middle and high school educator with particular interest in intergenerational programming. Prior to her teaching career, she served as her town's Council on Aging Director and later became cover-story writer and editor of The Senior Advocate (now called the Fifty Plus Advocate Newspaper), a Massachusetts-based mature market publication. Most recently she was the recipient of an award from the Soul-Making Keats Literary Competition sponsored by the National League of American Pen Women. Together, Max and Carolyn have created a book that is a necessity for the millions of children and grandchildren who are currently dealing with this incurable disease.